How Twitter helped me buy a new PC. After 5 years of service my original Alienware PC system was upgraded to the hilt. The only times it was turned off or restarted were due to either blackouts or having to install software or hardware updates. It has been an outstanding, hardworking gaming rig. Recently I started the whole researching cycle into a new gaming system and was a bit nervous looking at Alienware again as they had been purchased by Dell. 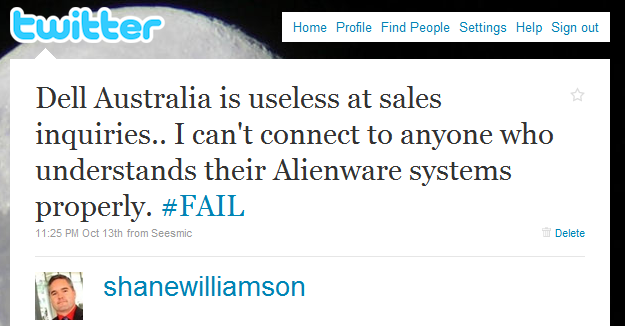 I played around with some online quotes on the Australian Dell site, but was disappointed with limited selection. I decided to call Dell directly to see of they could source some of the US system components. Calling Dell sales was excruciatingly painful. I talked to 4 different sales people, two of which hang up on me when I asked to many difficult questions about the PC components and the others where criminally uneducated about the Alienware systems. Simple questions about the power supply, motherboard components and upgrade options where all too difficult. I was disheartened that I was wanting to spend AUS$5000 on a new pc and I was getting treated like I was buying a $20 keyboard. … and you wouldn’t believe it but, someone from Dell read it. Within a few hours of my Tweet I was contacted by a local senior manager from Dell asking if I would like to talk to someone, whom he said, would be able to assist me. A short time later I was talking to a better sales person whom assisted me greatly. Unfortunately it turned out that the requirements I was looking for in a new PC were not going to be released in Australia by Dell for at least a month, so I requested to be contacted when they were released. This delay prompted me to look elsewhere and it became apparent that whilst a Dell Alienware system was not the cheapest or even the highest specification as from other suppliers, I was getting mixed responses by local “yum cha” PC dealers who wouldn’t have a clue about what a customer was or how to keep them, let alone appear interested that I had money to throw at them. Surprisingly Dell recontacted me, exactly when they said they would and with the better specifications I was looking for. Dell also stood out from the other vendors I got quotes from as they had a 3 year onsite warranty. 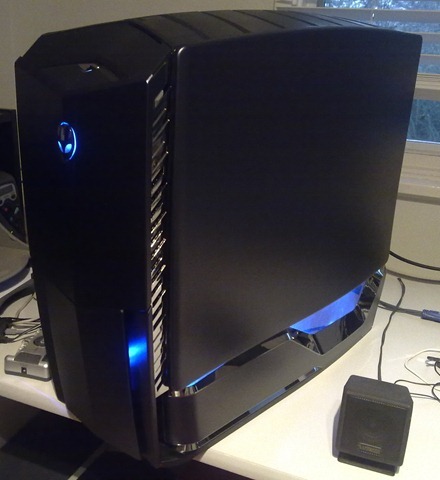 As Dell made a huge effort to win me back as a customer, I purchased a new Dell Alienware Area 51 ALX! Whilst I wasn’t expecting Dell to react to my initial Tweet about the poor sales experience, I was pleasantly surprised that they did. In fact I thought a competitor would read my Tweet and respond which didn’t happen. It is a crucial lesson for PC manufacturers to learn that if you are not listening to your customers or potential customers are saying about your products on social media networks, you are missing out on opportunities. Cluetrain Manifesto 101!